Proactively dealing with the results of possible opioid addiction is a smarter, safer path than reacting to a diagnosis of addiction. That costs employers approximately $10 billion from absenteeism alone according to a National Safety Council 2017 study and CompPharma Survey in 2015. The problem is getting worse and there are no clear signs that it will be solved in the near future. The federal government, along with most states, has declared opioid addiction an issue that must be dealt with immediately and comprehensively. But that doesn’t mean the problem is going away any time soon. And that leaves employers to make some very tough decisions. Taking control of this problem will need active participation from a variety of sources and will require multiple strategies. That’s why it’s important that medical providers, pharmacists, insurers, government agencies, state legislators, claims managers – along with organizations and their employees – all need to work to fight the opioid problem. Doctors are more carefully assessing patients’ risk for opioids misuse before prescribing. Insurers are requesting peer-to-peer reviews when they question whether an injured employee is being prescribed the most appropriate medications. And federal government agencies have issued new prescription and treatment guidelines, as have Minnesota and Wisconsin, along with many other states. 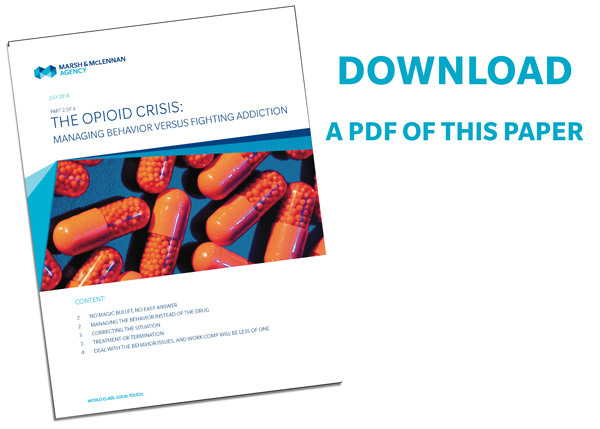 Opioids are responsible for a wide range of unacceptable work-related behavior, from absenteeism to seriously reduced productivity to attitude issues and more. Their use can also result in severe safety issues that may not only harm the employee, but other employees and property as well. So, why not simply test for drugs? Testing opens a Pandora’s Box of legal issues that can consume your time, focus and energy as well as potentially costing the company in medical care costs, rehabilitation, follow up testing, family leave time, additional insurance benefits, and even an adjustment of performance standards and possibly retraining and reassignment. Employers are not legally required to identify a disability (and addiction qualifies as one). That responsibility lies with the employee. When identifying unacceptable behavior, make sure the employee is made aware of it and that it has been noted and must be changed. That way, due diligence has been done. But what if the employee acknowledges that he or she has an opioid addiction problem? Then the employer must offer reasonable accommodation for that disability. But that should be the last resort rather than the first step. It’s better for the employer from a legal standpoint as well as from a workers’ compensation perspective. Prescription painkillers profoundly increase workers’ compensation costs, increase the length of worker disability and increase work time lost. $1.5 billion spent on opioids by workers’ compensation insurers alone. Opioid prescription abuse also significantly increases use of emergency room services, hospitalizations and other medical costs. PBM – How does narcotic use compare with benchmarks? Can they “lock in” usage, so members have to get prescriptions from a single pharmacy to reduce overprescribing? Can pill quantities be limited? Workers’ compensation carrier – Do claims for narcotics/opioids compare to benchmarks and standard treatment protocols? What should you look for in employee behavior? First, make sure termination is permitted. Some states require you to first provide leave for treatment. Also consider that replacing employees may cost more than the treatment, especially in a declining talent pool. And offering treatment rather than termination can have a positive result on your employee engagement and overall culture, which can affect turnover and leave rates. Longer-term prescribing of opioids more than triples the duration of temporary disability among workers with work-related, nonsurgical, lower-back injuries when compared to claims with no opioid prescribing, according to a study by the Cambridge, Massachusetts-based Workers’ Compensation Research Institute. And, after analyzing opioid prescribing practices following surgery and improving prescribing guidelines, researchers at the Mayo Clinic Department of Orthopedic Surgery in Rochester, Minnesota, saw a 48 percent decrease in opioids prescribed for hip and knee replacement surgery, according to a study published in Clinical Orthopedics and Related Research. Opioid abuse in the workplace can be a safety issue, a cost issue, a medical issue, and ultimately, a legal issue. It is a fundamental problem in society that is affecting the workplace and creating issues for employers that need to be handled strategically and with care. The more we can ameliorate the behavior, work to reduce the prescription problems, offer wellness assistance, and educate the workforce, the better chance employers have of reducing – or even potentially eliminating – workers’ comp claims caused by opioid overuse. Additional HR input and review for this article from Kate Bischoff, tHRive Law & Consulting. 2. HR Today. Combatting the Prescription Drug Crisis. March 1, 2016. 5. California Dental Association. “Role of Dentists in Reducing Prescription Drug Abuse.” May 14, 2015. Join MMA for a Seminar on the Opioid Crisis on September 18. Registration is open NOW! Click HERE to read Part One in this 4-part series.